After playing through a good half-hour or so of the game through the Galleon and into the Village that opens the game, I sat down with the game’s Producer and Writer, Koji Igarashi, to talk with him about Bloodstained: Ritual of the Night, the 8-bit side game Bloodstained: Curse of the Moon [OR Note: We gave it 4.5/5 stars], Igarashi-san’s experience with the Kickstarter process, and how he balances giving the Kickstarter backers what they want with the realistic expectations of game development. Until Bloodstained: Ritual of the Night’s release, you can keep up with all the latest news for it by checking the game’s official website, joining the official Discord channel, subscribing to the official YouTube channel and subreddit, following them on Twitter, joining the official forums, and liking them on Facebook. You can also visit the official Bloodstained: Curse of the Moon website. Bloodstained: Ritual of the Night is coming to Steam (PC/Mac/Linux), XBOX One, PlayStation 4, Nintendo Switch, and the PlayStation Vita at a date to be determined. Bloodstained: Curse of the Moon is out now for PlayStation 4, Xbox One, Nintendo Switch, PlayStation Vita, Nintendo 3DS, and Steam. This interview has been lightly edited for content and clarity, and was conducted through an English/Japanese language interpreter. Operation Rainfall: My name is Quentin H., and I am here with Operation Rainfall, and it is the first day of E3 . And you are? Koji Igarashi: My name is Koji Igarashi, producer of Bloodstained: Ritual of the Night. OR: What is Bloodstained: Ritual of the Night and Bloodstained: Curse of the Moon [about]? 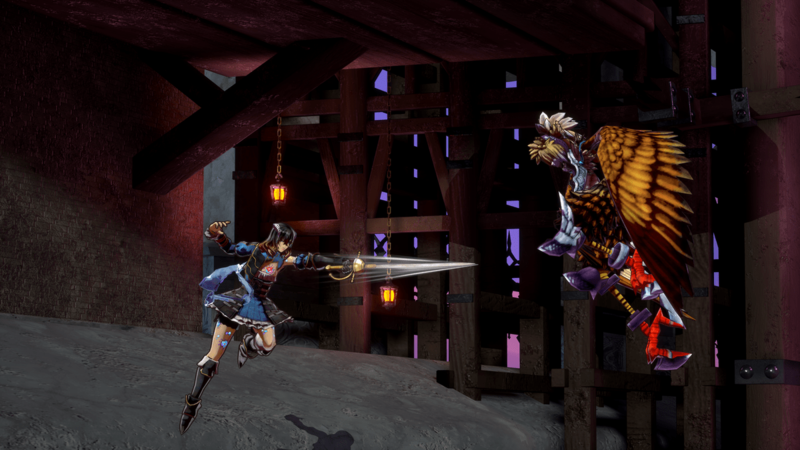 KI: First of all, Bloodstained: Ritual of the Night is a Kickstarter project and it’s a 2.5-D actual side-scroller game. And during the Kickstarter campaign, one of the stretch goals was to create an 8-bit minigame. And that 8-bit minigame is Bloodstained: Curse of the Moon. So that 8-bit game is separate from [Bloodstained:] Ritual of the Night– it’s a separate game and a spin-off of the main game. “When we started the Kickstarter, there were two parts- there’s a good and a bad side”. OR: From the beginning of the Kickstarter, it was said that “Dracula is part of a different legacy” and that “IGA is excited to take this opportunity to introduce new enemies.” What influences have [you] had to design the game, and why did [you] choose to move away from Dracula? KI: First of all, when we started the Kickstarter project, we wanted to keep away from Dracula – but it’s gothic horror that we wanted to stick with. And during that Kickstarter project, we wanted to create a more separate alchemy theme to it. So that’s where the inspiration came from for the enemies and the story itself. OR: We played the demo a bit ago, and we saw the influence of alchemy in how you can make things. Why did you choose to go with that aspect as the heart of [Bloodstained]? KI: Before we chose the theme [of] alchemy, we wanted to incorporate crafting and trying to craft items and things like that. But where alchemy came from – the story itself started off in the Industrial Revolution. That was the timeline we wanted to go with. And when we thought of the Industrial Revolution, it’s like ‘okay, so whenever there’s a revolution, somebody must have a disadvantage. Some group has a disadvantage.’ And when we thought about that, we thought ‘Well, probably alchemists are at a disadvantage during the Industrial Revolution where everything’s booming.’ So that’s why we chose alchemy. 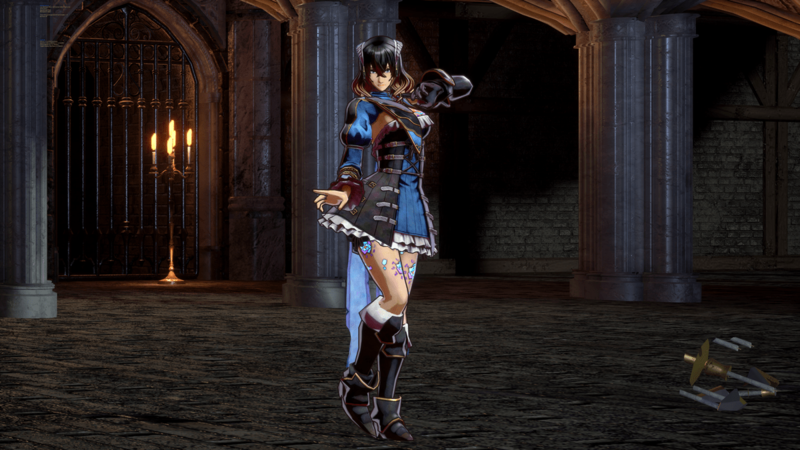 OR: [Bloodstained: Ritual of the Night] was very successful on Kickstarter – was this game funded solely through Kickstarter, or did additional outside sources come in to [help] fund it? KI: So you know, other than the Kickstarter, there’s also the reason why we’re here at 505’s booth – 505 Games is helping support our game. You play as Miriam, an orphan who is scarred by an alchemic curse, in Bloodstained: Ritual of the Night. (Image courtesy of 505 Games). OR: How did 505 Games get involved with this project? KI: Well, the main two reasons [are] that one- 505 Games is a worldwide publisher and this is a game that we wanted published worldwide. And another part of it is the funding part as the publisher. That’s the two main reasons. OR: On a personal note – what has the Kickstarter experience been like for you? The good side is that we get to hear the fans voices before the game comes out, while we’re developing the game. That’s the great part of Kickstarter and crowd-funded games in general. The bad part is that we have to commit to many things, many commitments – especially like stretch goals and things like that. And there are times where we have to show a lot of different materials and a lot of different parts of development, and its very hard when it comes to the release part where we might not have enough materials. And that’s the hard part- the promotional side of it. [Its] very hard. OR: How do you in fact balance the sometimes lofty expectations of the backers with the realistic expectations of game development? KI: So I guess that it’s difficult to balance it, but at the same time, it’s always changing as time passes. Like, for example, when we promised a lot of different stretch goals that we were able to do during that time – for example the Wii [U], but as time passes, consoles are changing [and] we have to change it to make sure that we fit into the [present] time. Miriam has a variety of weapons and abilities to use against her enemies in Bloodstained: Ritual of the Night. (Image courtesy of 505 Games). OR: Part of keeping contact with the backers was that y’all rolled out an official Discord server so that people could communicate in real time to the team. What has that particular experience been like? KI: Rolling out the Discord was really great, because before, we had the official forums where people would post comments and discuss about certain topics. But with Discord, everyone’s in a chat-kind of thing, so it feels like we’re working with the opinions a lot quicker than before. But at the same time, we’re keeping that same stance where we’re going to listen to everyone’s opinion equally and go ‘Do we agree with it?’, if so, we’ll implement it in the game. But we feel that [with] it, we’re a lot closer to the community. OR: Would you do Kickstarter again, knowing what you do now? 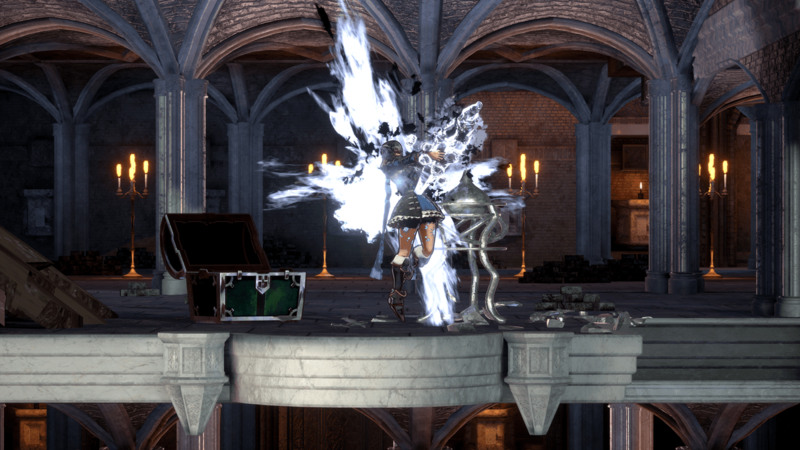 KI: It really depends, because the experience has the good and the bad side[s] of Kickstarter. And because the reason we started the Kickstarter was because that was the only way we were able to fund the game. So let’s say that if Bloodstained was successful, we probably wouldn’t do another Kickstarter. It would be – it’s supposed to Kickstart a project or a game. And that’s why – it really depends on where the funding comes from afterwards. OR: Moving onto [Bloodstained:] Curse of the Moon for just a moment- how was developing that game alongside [Bloodstained:] Ritual of the Night? KI: So I was more focused on [Bloodstained:] Ritual of the Night instead of [Bloodstained:] Curse of the Moon, and basically we were developing it at the same time. [Bloodstained:] Curse of the Moon was left solely to INTI CREATES [CO., LTD.], and they were the ones developing it and publishing it. I was only supervising the story and seeing the overall game itself. So I was focused more on [Bloodstained:] Ritual of the Night during that time. “So the demo we have here today, it basically is something that we wanted to make sure is as close to the full game and make sure that it’s something we want to have the backers play and give us feedback”. OR: In the Second Kickstarter update published May 13, 2015, an 8-bit stretch goal was announced. Could you tell us a little bit more about that, and did [Bloodstained:] Curse of the Moon have any influence on how it was developed for [Bloodstained:] Ritual of the Night? KI: So there’s absolutely no relation between the 8-bit level in [Bloodstained:] Ritual of the Night and the actual 8-bit minigame [Bloodstained:] Curse of the Moon. It’s actually completely separate design and 8-bit style. OR: Is there anything you can tell us about the 8-bit level? KI: No, not yet. But we hope that you please look forward to it. OR: Sony announced fairly recently that they were ending physical Vita cartridge production in 2019. Will there still be a physical Vita release for [Bloodstained:] Ritual of the Night? KI: Since Sony announced that they were ending physical copies, its gonna be difficult for us to make it, but at the same time, we’re still developing and we’re still trying to look into it and develop it for Vita. Combat takes place in a 2.5-D world. (Images courtesy of 505 Games). OR: How is it developing this game for practically every platform known to man? KI: It’s really difficult, I mean. *laughs* It’s a lot of work, a lot of work. OR: Is there a platform you find harder to develop for than others? KI: So yeah, since we’re doing all of this on a PC basis, we’re making it on PC first and then porting it onto different platforms. But we’re still in the middle of it, and we don’t know which one is the most difficult to do. It’s just that right now, we’re just figuring out ‘Oh, we’ll need to optimize this one’ and we’re trying to figure it out. But right now, maybe PS4 is a lot easier than the other ones but we don’t know honestly what is the most difficult. OR: When you rolled out [Bloodstained:] Curse of the Moon, there was a bit of a hiccup in distributing codes to different region with different platforms. What happened? KI: So we announced it during the time of the Summit. And during that time, the time between [the Summit] and the launch was very short. And I guess it’s mostly our responsibility that we needed to let the backers know, let the people know, that the [time] period [was] very short and also that the backer codes would have to be decided [upon] within this very short amount of time. Right after deciding to put a deadline on the backer codes, we had to generate the codes. So the timing after that was – it took a lot longer than we expected, and that’s the reason why we’re having this sort of hiccup in backer codes. But we’re getting the backer codes steadily, and we’re giving it out to the backers as soon as we’re able to get it. OR: It was announced that Region 3 Kickstarter backers outside of Japan were not getting a Playstation 4/Vita release for [Bloodstained:] Curse of the Moon. What went into that decision? KI: So this was actually decided that we weren’t going to release on Region 3 for Asia from the very beginning. But I guess with all the miscommunication, we weren’t able to announce it more clearly. But at the same time, INTI CREATES decided that that wasn’t something they were going to do, it was their decision to not release it to Region 3. OR: Moving more onto the game itself – how will local multiplayer work? KI: So that’s also a secret, because it’s something we want to announce during the Kickstarter. So it’s still a secret. OR: So we just tried out the E3 build demo that is coming to backers on June [21st]. How did you decide on the scope of the build, and how big is it in relation to the final game? KI: So the demo we have here today, it basically is something that we wanted to make sure is as close to the full game and make sure that it’s something we want to have the backers play and give us feedback, so that we’re able to have that time where we’re able to improve the actual game and make sure that there’s a lot of features in the main game that is in the demo. So when we compare it to the actual full game, we don’t know how it is going to be in the end, but we feel that it is probably one-tenth of the full game experience. So that’s why we’re making sure that we’re getting feedback and we want to make sure that we’re able to improve on it using feedback. OR: In the demo, I was able to try various abilities such as the Cerulean Splash, Raging Gale, and Fire Cannon. Do you have an ability you prefer? What’s your favorite? KI: So my favorite ability is – it’s further into the demo we have here today, it’s call Throw Axe. And it’s basically an ability where Miriam is able to throw a really huge axe at the enemy. So that’s my favorite. While there are clear influences from the Castlevania franchise in Bloodstained: Ritual of the Night, this title is distinguishable from that series. (Image courtesy of 505 Games). OR: Last couple questions. Once the main game is completed and published, are there continued plans for support for Bloodstained: [Ritual of the Night]? KI: That’s something we’re really interested in, we still haven’t really thought about it. But we wanted to create the basic foundation for Bloodstained: [Ritual of the Night], and if that foundation is as well-received as we hope it would be, we’re interested in [doing DLC]. OR: Final question – for someone who may not have heard of Bloodstained: [Ritual of the Night] until this E3, what do you have to say to them? 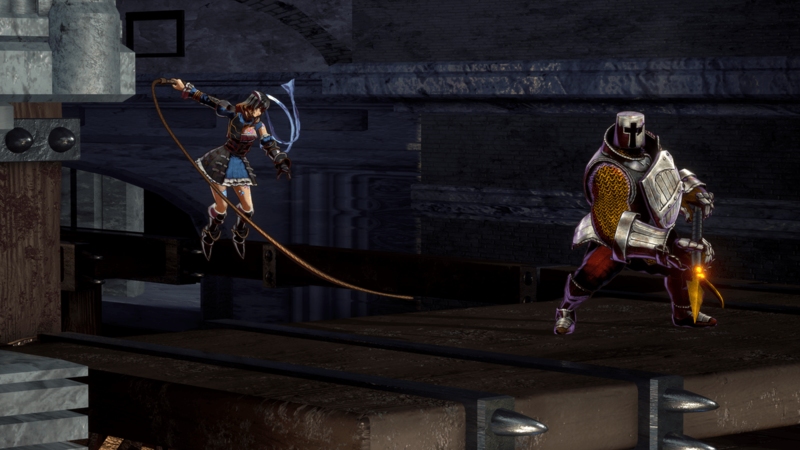 KI: To those who have never heard of Bloodstained: [Ritual of the Night] before this E3, we want to make sure that out of all the cinematic games that are out there that have very bright visuals, we want them to experience Bloodstained: [Ritual of the Night] as this sort of game that is very game-like. It’s very nostalgic, it goes back to it’s roots and that’s what Bloodstained: [Ritual of the Night] is. And that’s what we’re hoping to share with everyone. Did you back Bloodstained: Ritual of the Night? Are you excited to see what lies in the future for Koji Igarashi?